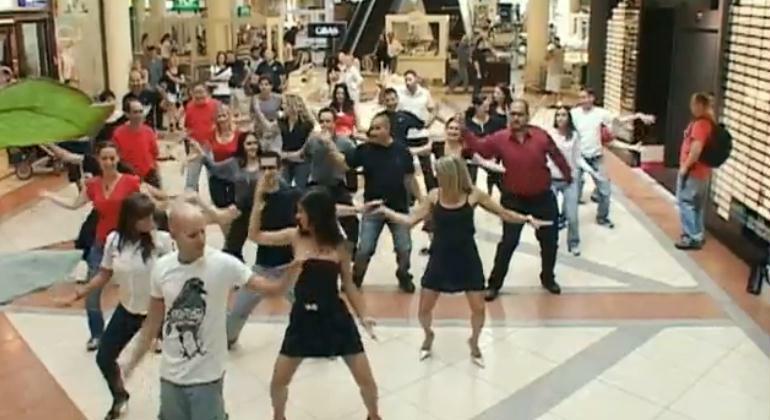 Our regular readers know that we really like watching flashmobs, especially in Israeli cities. Not just the performers, but also the surprised reactions of the unsuspecting shoppers and passersby who happened to be in the right place at the right time, and the way the performers suddenly materialize out of the crowd of shoppers and then just melt away back into the crowd at the end of their act. We previously brought you videos of flashmobs and spontaneous performances in shopping malls and in the streets of Jerusalem and Tel Aviv. This time it's the turn of shoppers and moviegoers at the Hamifratz Cinemall in Haifa, wo were surprised recently by the sudden performance of a choreographed dance to the popular Israeli song Lehishtatot Lif'amim. The dancers were 40 employees of G4S Israel, the country's leading provider of security solutions and comprehensive security. The Group provides advanced security services, security systems and technology-rich protection, identification and control systems and patrol call center services. How many cameras were used. It looks like a big production.